One of the first things I do when helping someone with their DNA results is to check if their parents are related. This can explain unusual patterns of matches, for example, all seemingly from one side. 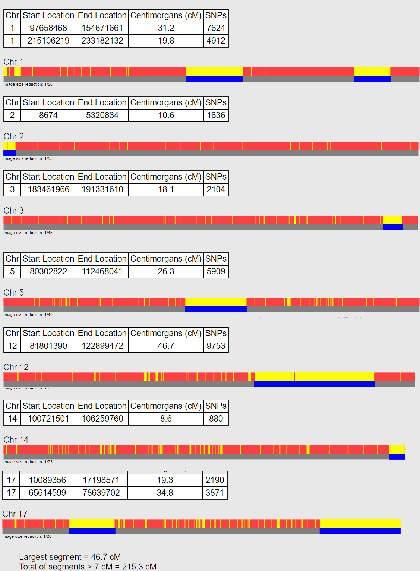 GEDmatch.com has a nice tool called “Are Your Parents Related” (AYPR) in the”Analyze Your Data” blue panel (middle right of page) which looks for places in the specified kit where the DNA is identical on both chromosome pairs, maternal and paternal. This happens when you inherit the same segment of DNA from each parent because they are related. 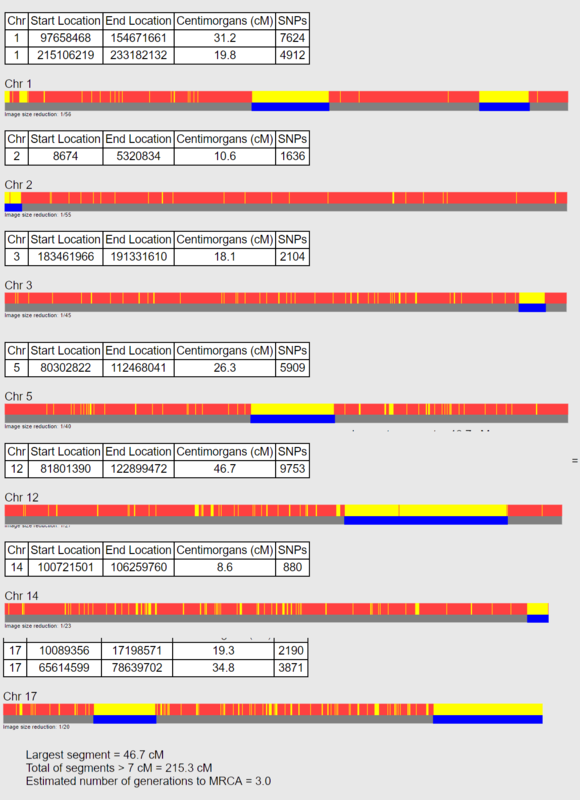 We call this a homozygous run which is a fancy way of saying a stretch of identical DNA on both sides. 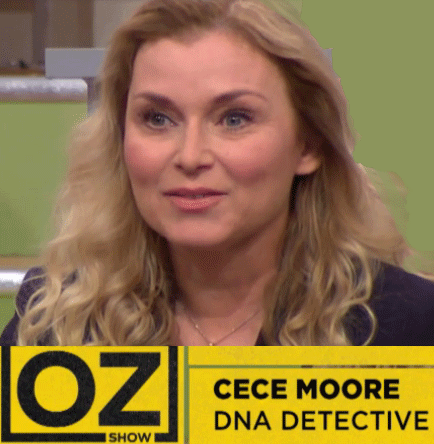 CeCe Moore specializes in helping people who make this discovery. Click here for the informational brochure she helped Brianne Kirkpatrick, genetic counselor, create. It includes where to get emotional support. 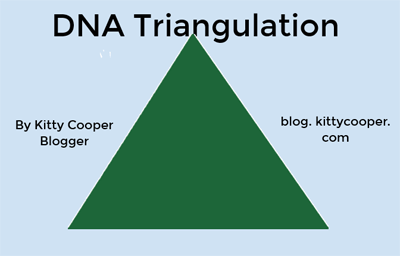 My goal is to help you figure out what the DNA means yourself. Can you deduce what the relationship of those parents is? Well a very simple rule of thumb is to multiply the shared DNA from AYPR tool by four and look up that new total at the DNA painter calculator for the possibilities. Then do further family DNA testing to confirm. Why does this work? Let’s look at the numbers. Suppose your parents share 25% of their DNA. They will pass about half of that to you, so 12.5%. However only about half of that will be the same DNA so it will show up as about 6.25% on the AYPR tool. I am very grateful that Ancestry.com has sponsored live streaming of the Jamboree since my foot problems are keeping me home now. There is one selected presentation available in each time slot. As always I loved listening to Cece Moore. I learned a few things from her presentation about some of her adoptee success stories. Many more genetic genealogy stars were there: Blaine Bettinger, Tim Janzen, Angie Bush, Judy Russell, and Kathy Johnston. Sadly I had to miss most of their presentations since I gave two of my own. I was pleasantly surprised by the full house at my triangulation lecture. It was exciting to be live streamed. A number of folk told me afterwards that they felt like they finally understood this concept. What I did was present a number of real life cases from my own research where I used DNA triangulation to figure out relationships. That seemed to work well. It looks like tonight’s show will showcase the ancestry of a number of jewish celebrities. Since Ashkenazi research can be particularly difficult and the DNA very tricky due to that population’s endogamy, I am particularly interested to see what I can learn. Cece Moore‘s latest blog entry at the PBS site was just posted. 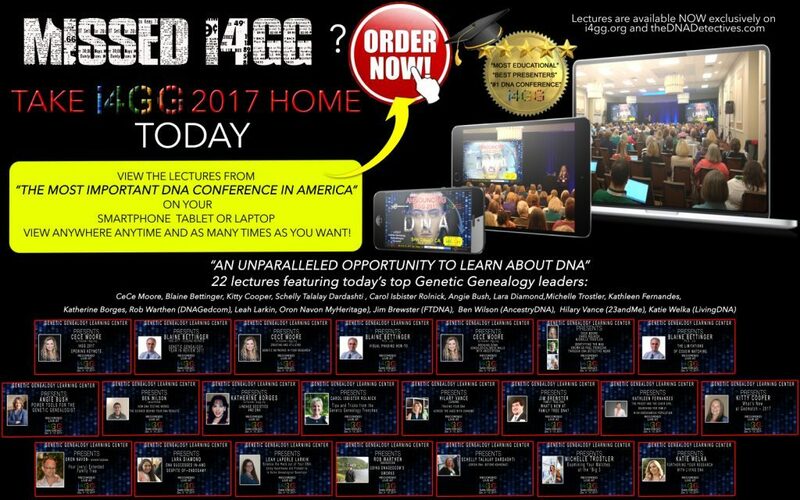 Each week she discusses some of the details of the DNA work she did for the previous show.